What are the key features of the PM Kisan Samman Nidhi scheme? Main objective – The main objective of the scheme is to provide help to framers relating to cultivation purpose on small lands. With the help of this scheme, the small farmers will be given direct financial support. Amount given by government – The central government, has stated that it will spend almost 75 thousand crore rupees on a yearly basis where each farmer will get rupees 6,000 every year in three phases. Therefore, the central government would spend 100% on this scheme. Mode of payment – The money given by the central government will be directly credited to the linked bank accounts of the small-sized farmers. Benefits of the farmers – The small farmers will be benefitted by this scheme, and after the implementation of the estimated budget, near about 12 crore farmers will be benefitted from the same. Double farmer’s income – By the implementation of the scheme, it will help to double the farmer’s income by 2022. The Modi government will work to provide relief to the farmers. In addition, the scheme will also help to improve the miserable condition of the farmers. 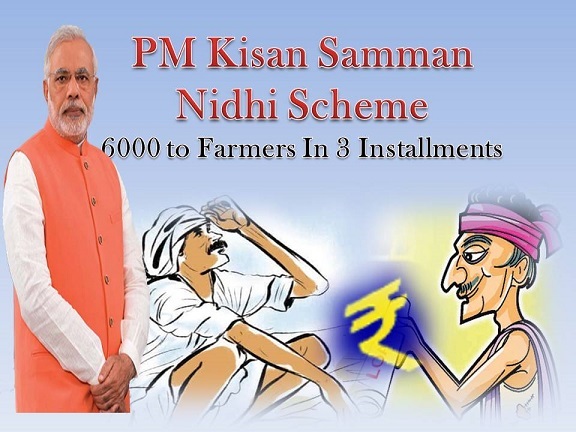 What are the eligibility criteria of PM Kisan Samman Nidhi scheme? Indian resident – Only the small and marginal farmers belonging to India will be benefitted from this scheme. Area of land – Farmers having land up to 2 hectares will be able to avail the benefits of the scheme. The farmers have to introduce documents pertaining to the area of land. In addition to this, farmers have to produce documents that support that the farmer only belongs to India. However, no such application process of the scheme has been declared by the central government. As soon as it comes up, the eligible farmers will be the first to know about it. Thus, with the help of this scheme, the finance department will be able to improve the condition of small and marginal farmers. 7th Feb :- First installment of rs 2000 would be given to farmers by the end of march. 8th Feb :- Government of India have launched official portal for PM-Kisan Yojana http://pmkisan.nic.in/. 14th Feb :- PM Modi will launch this mega scheme on 24th Feb.
15th Feb :- The implementation of the PM Kisan Scheme brought a smile on the faces of a large number of farmers. But a greater number of similar professionals were also left out of this project. The Modi government has taken an epic decision to review the application, attained from the states, to include those, which were unable to get the benefits during early implementation. The inter-ministerial committee will look after the revision task, and make necessary changes. The head of the committee is the current finance minister of the country. Once the revision tasks are over, the implementation of the scheme will be done in a fresh manner. 21st Feb :- Central government have asked to collect impacted farmers data as soon as possible. 24th Feb :- PM Modi officially inaugurated this scheme from Goraphpur (UP). 5th March :- Second Installment should reach farmers just before election date.